Joy Villa is at it again. The 26-year-old singer once again used the Grammys red carpet to make a political statement. Last year, Joy wore a gown made from Donald Trump campaign material. This time, however, she opted to wear a white bridal dress painted with a rainbow-colored image of a fetus. Joy herself hand-painted her Pronovias sleeveless ball gown with the fetus portrait based on the sonogram of her own daughter, whom she gave up for adoption. 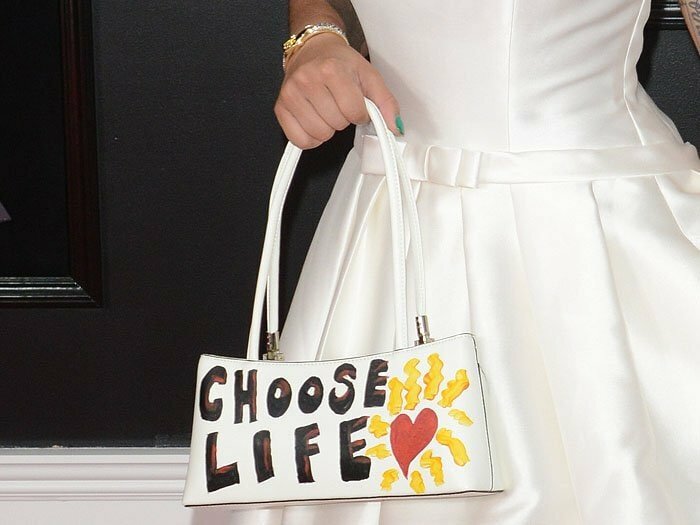 She also painted her white handbag with the words “choose life” to match her statement-making dress. The little-known artist topped off her bizarre, head-scratching look with a beauty queen crown. 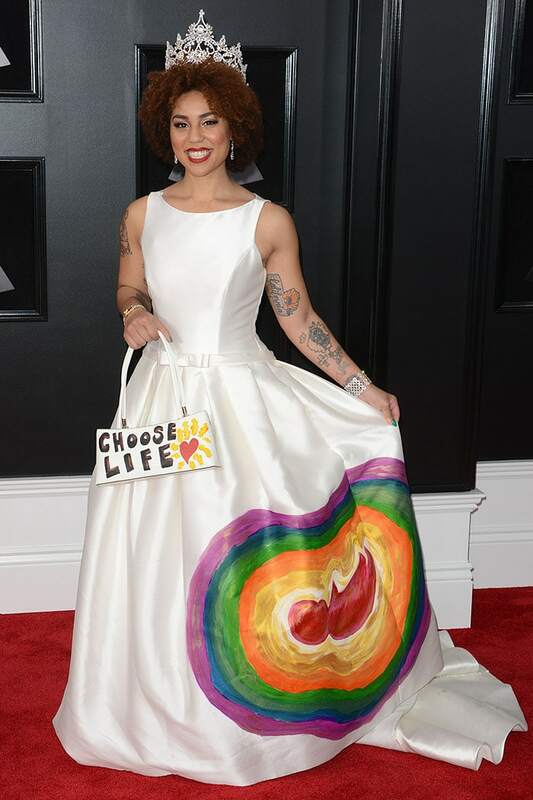 Joy Villa wearing her hand-painted pro-life gown at the 2018 Grammy Awards held at Madison Square Garden in New York City on January 28, 2017. 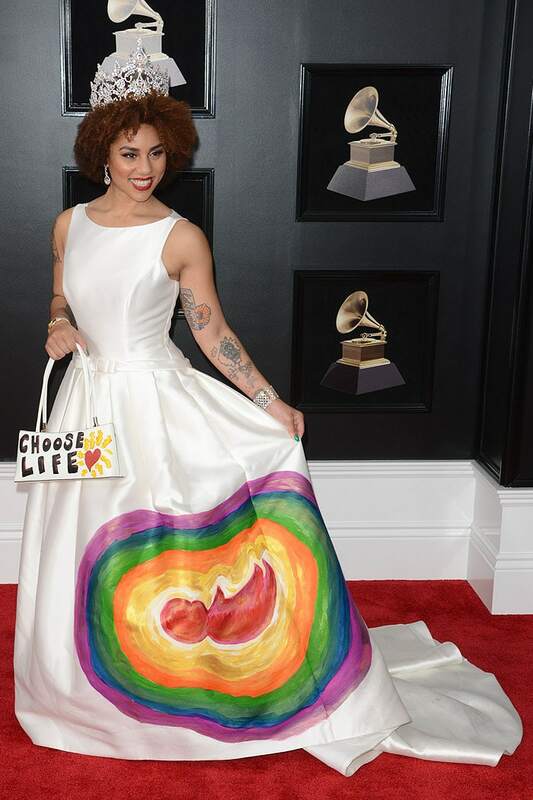 Joy Villa’s pro-life ensemble is actually tame by her standards. At last year’s Grammy Awards, she drew criticisms in a pro-Trump “Make America Great Again” dress. Prior to that, she constantly made worst dressed at the Grammys lists with her flesh-baring, attention-seeking fashion choices. Joy Villa in an orange netted dress at the 2015 Grammy Awards, in a black skeleton dress at the 2016 Grammy Awards, and in a pro-Trump “Make America Great Again” dress at the 2017 Grammy Awards.